A common SDG ontology will help match from one SDG goal to the next. The resulting Sustainable Development Goals Interface Ontology will structure the data to provide a high level of connection between more specialized domain ontologies that will offer cross-reference entities of sustainable development knowledge allowing information to be shared across disciplines. 25 September 2015, the 193-Member United Nations General Assembly formally adopted the 2030 Agenda for Sustainable Development, along with a set of 17 new Sustainable Global Goals (SDGs) and 179 targets. The SDGs have a universal, integrated and transformative vision for a better world. 11 March 2016, New York, the proposed set of 230 global indicators for the SDGs was agreed by the 47th Session of the United Nations (UN) Statistical Commission. How does all this fit into an ontology? The fact is that often there aren’t universally accepted or precise definitions for different terms related to their use in a number of UN programs of the SDG Project (e.g., “forest” used in the United Nations Environment Program, UNEP). Moreover, each SDG target needs to have one or more indicators linked to specific data points that UN statisticians and the general public can monitor to assess progress on this or that issue. It is evident that the SDG Project requires data quality and transparency, also in view of more rational and accurate analysis and measurement of progress of its objectives. 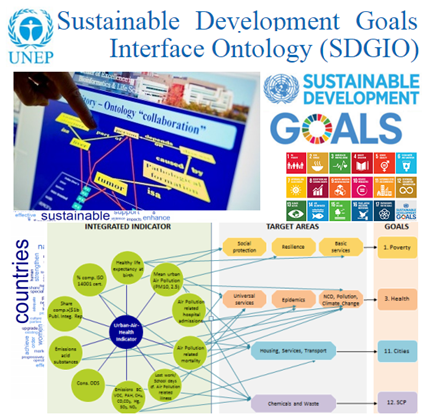 To that end, UNEP, in collaboration with experts in the field of ontology, started to develop a Sustainable Development Goals Interface Ontology (SDGIO) , so that entities relevant to the SDGs can be logically represented and defined in various facets as well as interrelated and mapped to the corresponding terminology in glossaries and resources such as the UN System Data Catalogue and SDG Innovation platform. The SDGIO project employs an approach in creating ontologies based in ontological realism, developed in large part by Barry Smith (Professor in the Department of Philosophy and Director of the National Center for Ontological Research at the University at Buffalo). How will the SDGIO be used in the UN project? As a semantic model representing knowledge in particular domain of inquiry, the SDGIO aims to provide a semantic bridge between: (1) the entities referenced by the SDGs, their targets, and indicators; (2) the large array of entities they refer to. The SDGIO will import classes from numerous existing ontologies and map to vocabularies such as GEneral Multilingual Environmental Thesaurus (GEMET) thus creating a better, more uniform approach to representing the data and to promoting more precision, better consistency and interoperability. New classes will be minted and defined where no external class exists to provide a better way of integrating information used in monitoring the status of how various SDGs and targets are being addressed around the world. It is worth noting, that the SDGIO is not going to change the way member states conceptualize their own understandings of certain terms. On the contrary, the SDGIO is going to create a way to represent the diversity of definitions and make that diversity of usage more transparent to people looking for data that is relevant to indicators. Additionally, there will be developed a way to show how disparate data (cutting across multiple goals and targets) is linked together through a variety of common themes. Mark Jensen (Ph.D. in the Department of Biomedical Informatics at the University at Buffalo) together with Pier Luigi Buttigieg (a post-doctoral researcher at the Alfred Wegener Institute for Polar and Marine Research, the lead of the Environment Ontology project ENVO) have been invited (by UNEP Chief Scientist Jacqueline McGlade directing the SDG project) to work on the SDGIO ontology effort as consultants. The first phase of the SDGIO ontology will be finalized (as an OWL ontology) this spring and will be implemented on the portal UNEPLive where it will be possible to discovery all the needed terms and definitions (in hierarchical fashion and with established formalized links between the lower-level terms in that hierarchy). The complete semantics will grow over time as other existing ontologies - including those developed by ENVO (for the environment), CHEBI (for chemicals), OBI (for biomedical investigation), and PCO (for population and communities) - will be reused, and new ontologies will be formed to address many of the domains related to SDGIO (e.g. no ontology yet exists for human rights or financial measures). The SDGIO ontology will help UN statisticians to tag the data using a few terms from the ontology (in addition to metadata such as “provenance”, “geographic location” etc.) as well as to enhance the discoverability of data related to “basic services” (tagged with the “essential services”) in all contexts. Researchers will be able to drill down to determine whether information aligned with the other data tag fits their assessment requirements. Besides, it will be also possible to leverage the ontology for visualizing terms, definitions and the relationships between them, along with editor notes and comments about variations and extra annotations in usage. “An important aspect of the workflow is to elicit the feedback of relevant domain experts to guide their efforts in refining the semantics to better reflect the various domains surrounding the SDGs, such as legal entities, social policies, economic systems, equity and human rights, ecosystems and biodiversity, infrastructure, public health and education”, said Mark Jensen. The SDGIO working group welcomes input on any theme related to the SDGs, especially from those working in connected fields. Please see the discussions on this issue tracker and please be encouraged to share your knowledge!